We’d love your help. Let us know what’s wrong with this preview of Renegade Skyfarer by R.J. Metcalf. When Ben wakes up, he has no memory of his family, his home, or how he got to this strange world. All he knows is what his new crew members tell him: the magical Barrier that protects their land is weakening. Unless they find the artifact that can repair it, all of Terrene will be destroyed and enslaved by the The airship crew saved Ben’s life from a dragon, of all things. To ask other readers questions about Renegade Skyfarer, please sign up. I'm a little bit speechless after that massive number of FEELS. Seriously, HUGE feels that leaves you breathless, on edge, or crying. I'm still deciding on which one I'm feeling, but I think let's go with "all of the above." This was an excellent debut! I enjoyed it from the beginning to end and loved how the author did a fantastic job of making each crew member unique. I was slightly afraid I wouldn't know who was who, but I didn't really have that problem. Goodness, the plot twists were VE Well. Renegade Skyfarer had a very satisfying ending, though left questions open for book two, which has me excitedly nervous because I absolutely love Ben. I might know some more of his past, but there are still questions he's asking that I also want to know, so hopefully those will be answered in book two. Overall, I definitely say that if you love fantasy and steampunk, this is a very good read! It was different and unique, mixed in with a bunch of feels (like a BUNCH of feels) and angst. Let’s not also forget those action scenes that are so real it’s like you’re watching a movie. Can't wait for Void Born to release this fall! This is a perfect example of 'don't judge a book by its cover' (even though I totally do that with every single book ever). It was a great read and I really enjoyed it! The characters were interesting. The relationships were so realistically complicated and complex. Each character had a well defined, individual personality. It was well written and engaging, though I did skim a few parts simply because I was too impatient to read it slow. I guessed the plot twists before they were revealed, and a c This is a perfect example of 'don't judge a book by its cover' (even though I totally do that with every single book ever). It was a great read and I really enjoyed it! It was well written and engaging, though I did skim a few parts simply because I was too impatient to read it slow. I guessed the plot twists before they were revealed, and a couple of them were a little cliche, but I still enjoyed it immensely anyway. As I was approaching the end, I realised something I should have remembered much earlier...there's a sequel. So obviously, not all the plot gets wrapped up, but I'll definitely be snagging a copy of the second book at some point to answer some of my remaining questions! Wow. Never have I felt so wildly different about the first and second halves of a book. The first half nearly made me give up multiple times, the second was jam-packed with action and twists that kept me intrigued and turning pages. Why the difference? Ultimately, almost every significant plot-related even happens in the second half of the book. For nearly the whole first half, I had no idea what the central conflict even was, and so the story seemed to drag. Apart from a super intriguing prologu Wow. Never have I felt so wildly different about the first and second halves of a book. The first half nearly made me give up multiple times, the second was jam-packed with action and twists that kept me intrigued and turning pages. Why the difference? Ultimately, almost every significant plot-related even happens in the second half of the book. For nearly the whole first half, I had no idea what the central conflict even was, and so the story seemed to drag. Apart from a super intriguing prologue and Ben waking up memoryless on the Sapphire, everything the characters do is a continuation of their lives before the story started. They hunt for a way to fix the keystone and hit dead ends. They stop in cities and talk to their contacts. They go to sporting events and markets and taverns and the palace. They fight (awesome, terrifying, INVISIBLE) dragons. They have relationship issues and regain flashes of memory. Don’t get me wrong, there’s plenty of conflict (both external and especially internal), and it’s clear from the blurb that trying to fix the barrier is the crew’s central goal, but the event that finally sets things in motion happens about halfway through, and Ben’s dilemma mentioned in the blurb (view spoiler)[happens during the resolution (hide spoiler)]. Perhaps most frustrating to me was about a quarter of the way through the book, when Ben finally meets someone who recognizes an object he’s wearing from his former life. The guy gets super nervous, mutters something about “another one,” and tells Ben to destroy the object. Ben walks away without asking any questions. This leads to the other thing that frustrated me, which is character passivity. Part of it is, I think, related to the structure problems I just noted—with no significant event to kickstart the story, there’s no way for us to see how the MCs’ wants/goals/fears are affected by the new situation into which they’ve been thrown. In addition, Ben and Jade both have fairly intangible goals. Memory loss is hard, because apart from asking questions and trying weird memory-jarring techniques (settle down, Doctor Jaxton), there’s really not much you can have the character do but wait, and in Ben’s case, there’s not much character arc involved in regaining his memories. Jade, meanwhile, questions her worth and feels stifled by her family and friends, wanting to prove herself but always held back by her father’s fears. She has a concrete goal, but it’s more long term (she’s sort of biding her time and waiting for the right moment), and even after she learns something about her past which changes everything, she spends a lot of the story wrestling with frustration about her relationship with Zak and (for a while) debating whether she should pursue Ben instead. My guess is that Metcalf is playing the long game and spreading their growth arcs over the whole series, but in this book, both characters felt more like passengers than active drivers of the plot. And then comes the second half! Once the story picked up, it kept going and gathered more and more twists as it went, and I’m glad I pushed through to the end. I love how the prologue finally tied into the plot, and I’m really curious to see how Blade’s story plays out in future books—at this point I find him and Finn (I LOVE FINN) the most interesting of the characters, which probably says something about me. I can’t say a whole lot more here without revealing many spoilers, and I feel kind of bad after the onslaught of comments about the first half, but suffice to say that (apart from some confusion over the introduction of more new characters throughout the second half) I enjoyed where the story went. A final observation since I know some spec-fic readers are picky about language. This story has some really fun in-world slang (“blimp-for-brains” may be my new favorite insult), but also some modern-Earth-sounding phrases. There are instances of “okay,” “guys,” “man” (as in, “Hey, man, what’s up?”), “freak out,” and “burn” (“Oooh, burn!”), to name a few, so take that however you will. A fun steampunk adventure with great characters and political intrigue and an adorable, angsty slow-burn romance that gave me all the feels. I need book 2 yesterday! Renegade Skyfarer mixes classic fantasy with steampunk in a unique world with awesome characters. You'll soar on airships, fight dinosaur-inspired dragons, cheer for adorable romances, and uncover political secrets and plots in this epic new series. - It's clean! I find it so nice not to be berated with cursing and unnecessary sexual scene Treasure Planet meets Jurassic Park for an addicting steampunk adventure. - It's clean! I find it so nice not to be berated with cursing and unnecessary sexual scenes, and I can recommend it to teenagers without any worries. - Plenty of humor, because who doesn't love a good laugh? - It can get pretty bloody in the fight scenes, and one scene is particularly gruesome and jarring. But it definitely serves its purpose in the story, so it's not thrown in there for no reason. The descriptions didn't bother me, but I can see how someone who's sensitive to such things might cringe. But really, if you're used to reading this genre, you probably won't even blink. There was so much going on in this book that I don't know where to start. I'll start with the dragons because this what sucked me into the story. I loved the different dragon species. It's like How to Train Your Dragon. All the special things they do. There are multiple view point characters. Captain Slate, his daughter, Jade, the mysterious Blade, and an amnesiac named Ben. My favorite was Ben, since everyone Renegade Skyfarer by R. J. Metcalf is the first book in a new steampunk fantasy series. There are multiple view point characters. Captain Slate, his daughter, Jade, the mysterious Blade, and an amnesiac named Ben. My favorite was Ben, since everyone had to explain things to him. It was a great way to introduce world building without bogging down the narrative. I also loved watching him get his memory back and learning his past. A must read for lovers of romance, steampunk, and magical fantasy. In Terrene, different stones possess a variety of magical functions—from ship powering capabilities to anesthe 4.5/5 stars! In Terrene, different stones possess a variety of magical functions—from ship powering capabilities to anesthesia and even healing. In a way, though, all those little world-building details are just icing on the cake. In my opinion, what really powers this story (pun intended) is not the characters' overall goal of keeping the barrier intact, but rather the trickling of backstory and well-timed reveals. In that respect, R.J. Metcalf is master of story questions. As someone who's spent a fair amount of time contemplating story structure and plot, I was amazed at how often the reveals alone kept me involved. Also, while there were times I had a good guess what was coming, it was never well-in-advance of the reveal. Not to mention certain story surprises that caught me completely off guard—in spite of all the little hints adding up to the shocking truth. No real negatives to report, though I will admit I was leaning more toward a 4-star rating leading up to the first plot point. The beginning was strong, the characters in full pursuit of their main goal—until they hit a snag and had no choice but delay. In the brief calm, my story-analyzing consciousness kicked in and I realized Ben might've been more proactive in uncovering his identity. That was the only moment in the story where I might've preferred a greater momentum. BUT—the respite didn't last long, and my impressions soared toward the 5-star mark as the story went on. Sensitive readers should be aware of a few curses. If you're not fond of violence or gore, a few of the descriptions might prove too graphic. None of those aspects were so intense as to bother me personally, but I know other readers have different tastes. I'm sure my review fails to capture all the aspects of this story I loved—like the playful mood. However, I feel it's important for the romance lovers out there to know there's a healthy dose of romantic tension. (Yessss!) I won't say how it ends, but I'm satisfied—for now. And very much looking forward to the next adventure in the “Stones of Terrene” series. * For more an expanded analysis, Google search “storystorming renegade skyfarer” and peruse my 07/14/2018 post. The world crafted by R.J. Metcalf in Renegade Skyfairer is truly fascinating, as it combines all the beloved elements of a fantasy novel (magic, sword-fighting, dragons) with the uniqueness of a steampunk world. The airship Sapphire is probably the most amazing features of this new word, fusing magical gravity stones, a gear-powered engine, and solid wood ship into a spectacular flying machine that is beloved by both the characters and the readers. While the central plot of the book revolves arou The world crafted by R.J. Metcalf in Renegade Skyfairer is truly fascinating, as it combines all the beloved elements of a fantasy novel (magic, sword-fighting, dragons) with the uniqueness of a steampunk world. The airship Sapphire is probably the most amazing features of this new word, fusing magical gravity stones, a gear-powered engine, and solid wood ship into a spectacular flying machine that is beloved by both the characters and the readers. While the central plot of the book revolves around a good vs. evil fight to save the world, the heart if this story, however, is the relationships between the crew of the Sapphirre and their allies. The story does a great job of introducing the characters quickly and absorbing the reader in their adventures so that by the 3rd or 4th chapter you are completely invested in their lives. You feel their fears, pain, frustration, love, and loss, as if you were a member of the crew yourself. Metcalf has spun an innovative steampunk fantasy tale with plenty of twists and heart. Humor, action, intrigue, and heart-wrenching reveals keep the story moving briskly. I can't wait for Book 2! I saw the cover for this book and knew I had to read it. I mean… airships AND dragons? Yes, please! However, it took me quite a while to get into this one. The first half of the book kind of trudges along and didn’t feel like it was heading anywhere in particular. I didn’t feel like the pace really picked up or the story really grabbed me until I was almost 60% of the way through the book, what was there was enjoyable, and the characters were pleasant to hang out with, but it wasn’t really pulli I saw the cover for this book and knew I had to read it. I mean… airships AND dragons? Yes, please! BUT I'm really glad I stuck around, because the final 40% of the book was a wild ride of intrigue and adventure that was totally worth waiting for. And HEARTBREAK! Oh my goodness, so much sadness at the end. I'm still a little in shock about that. I liked the story, and I look forward to seeing what happens next with these characters. I believe this is the debut novel for this author, which probably accounts for the rough edges on the first half of the book. Magic. Dragons. Mystery. Peril. Betrayal. Love. All this and more in this wonderfully crafted tale from another world. For all Fantasy lovers and Steampunk fans, add this book to your reading list. I love a book that you can read twice and still get caught off guard by the plot twists (and I did read it twice before writing this). This is one of those books!!!! Be prepared for mystery, magic, trill, emotions, emotions, and more emotions in this gripping tale. Where did it loose that half star? Honestly, there was more blood than I usually enjoy, and dragons oddly slipped out of the picture in the second half of the book. All in all, I loved this book and I can't wait for BOOK TWO!!!!! With airships, dragons and the promise of high-stakes adventure, Renegade Skyfarer was an easy book to convince me to pick up. We start out with a prologue that is a tantalizing draw into the story and from there meet Ben, who has no memories of his past and was found in a dangerous location by the crew of the airship Sapphire. As Ben stays on, snippets of his past come to him while he befriends the rest of the crew and hopes traveling with them will help him remember who he is. 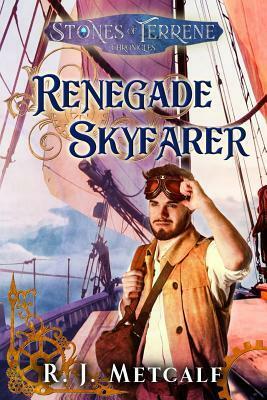 Along with him, w With airships, dragons and the promise of high-stakes adventure, Renegade Skyfarer was an easy book to convince me to pick up. As Ben stays on, snippets of his past come to him while he befriends the rest of the crew and hopes traveling with them will help him remember who he is. Along with him, we discover the magic of Terrene, the political squabbles that still smolder and what Slate, the captain of the Sapphire, is hiding. There is a spy working against the Captain to undo his efforts to restore the magic barrier that protects Terrene—and someone long thought dead who comes back to seek revenge. As the story’s main plot is wrapped up, we are still left with questions (and suspicions) about Ben’s identity, which adds a neatly woven mystery for us to explore in further books in the series—always a bonus for me! The first in the series Stones of Terrene, R.J. Metcalf’s Renegade Skyfarer is a delightfully spun tale with all the elements an adventure needs; intrigue, betrayal, revenge, redemption and a touch of forbidden love. I look forward to discovering more about Ben in the next installment! The promise of dragons and airships drew me to this story, but the fantastic cast of characters really captured my attention and kept me reading eagerly. Jade is a fierce female mechanic with relatable inner struggles. Ben is an easygoing sweetheart. Slate is a strong and determined captain that you empathize with. Krista and Briar are loyal friends. And Zak... ZAK!!! That broody and dedicated swordsman really captured my heart. The airship isn’t the only ship in this book, y’all, if you know wh The promise of dragons and airships drew me to this story, but the fantastic cast of characters really captured my attention and kept me reading eagerly. Jade is a fierce female mechanic with relatable inner struggles. Ben is an easygoing sweetheart. Slate is a strong and determined captain that you empathize with. Krista and Briar are loyal friends. And Zak... ZAK!!! That broody and dedicated swordsman really captured my heart. The airship isn’t the only ship in this book, y’all, if you know what I mean! If you like angsty slow-burn ships as much as I do, you’ll love this book. This story plot kept me interested the whole way through, but that last half of the book had me literally shouting at my Kindle in suspense! Loved the twists and turns this story took. I was just along for the ride! I'm at the 21% mark and decided to give up on this one. I'm just not enjoying it. I don't think the author is doing a good job of informing the reader of what is going on. I would expect that in a book where the main character has amnesia, but then the story should be all their first person observations. If the book follows other characters, their actions need the context of the world they're interacting with. That information is just too sparse for me. But I'm typically not a fan of steampunk, s I'm at the 21% mark and decided to give up on this one. I'm just not enjoying it. I don't think the author is doing a good job of informing the reader of what is going on. I would expect that in a book where the main character has amnesia, but then the story should be all their first person observations. If the book follows other characters, their actions need the context of the world they're interacting with. That information is just too sparse for me. It's a great steampunk novel with engaging characters and a plot that just kept going, twisting and turning until the very end. I honestly couldn't put it down, and kept reading far too late into the night to finish. The only problem I have with it is having to wait for the next one, and not being able to get my own airship. If you like well-written novels that drop you into the action and don't let go until they've finished pummelling your heartstrings, this is a must read. Great Entertaining and Engrossing Fantasy!!! This book is a very interesting and capivating blend of steampunk and magic! It's very unique and full of characters that grab your attention. The storyline is unpredictable and suspenseful. It's a very well written and action-packed with romance as well. If you like steampunk or magic and romance in an action-filled adventure, you must read this book!!! This book was excellent. Kept my attention the entire way, and the characters were complex and interesting. The plot surprised me at several points and I actually teared up once or twice, which for me is saying a lot! The romance in the book was the perfect amount and well-executed. Definitely would like to read the next book! Great fantasy tale that kept me reading straight through till the end. A fascinating world with a host of characters that keep the plot moving and exciting ! Good read! Renegade Skyfarer has the feel of a classic fantasy adventure, as we follow the crew of the airship Sapphire as they search for a way to fix the barrier that protects Terrene. There’s political intrigue as well to give it an unique flavor, and I was engaged throughout as the plot unfolded through it’s twists and turns. The steampunk setting is vivid and I felt like I was a part of the world that RJ Metcalf has crafted in her debut novel. I love the idea of magic rocks and the way that magic is tr Renegade Skyfarer has the feel of a classic fantasy adventure, as we follow the crew of the airship Sapphire as they search for a way to fix the barrier that protects Terrene. There’s political intrigue as well to give it an unique flavor, and I was engaged throughout as the plot unfolded through it’s twists and turns. The steampunk setting is vivid and I felt like I was a part of the world that RJ Metcalf has crafted in her debut novel. I love the idea of magic rocks and the way that magic is treated here, not as a cure all, but more like enhancers to make life just a bit easier. The tech is fun too, especially as newcomer Ben struggles to understand it all. I connected to most of the characters, who brought their own personality and fun to the story. Jade was my favorite, the fiery mechanic who’s trying to prove her worth to her father. I especially felt for her in the later stages of the story. I also loved Ben, our protagonist, who’s arrived on the ship without his memories, but doesn’t feel like a blank slate like many amnesiac characters. He’s clueless about Terrene to start, but at the same time, willing to help the people who saved his life. As the story moves forward, he struggles between his new friends and his returning memories of his old life, and I really liked how it was handled. Slate is the leader of the Sapphire and while kind, compassionate and protective, is motivated deeply by past regrets, which we learn runs deeper as the plot continues. There’s five points of view total, but the story didn’t feel bogged down.